Wallpaper stripping used to be one of the least liked jobs in DIY. Well, not anymore! 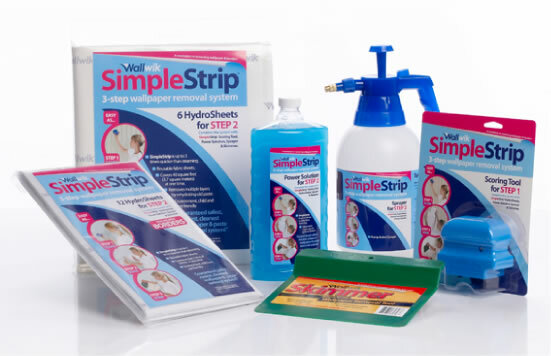 The experts at Wallwik have invented an entirely new system for Wallpaper Removal called SimpleStrip, which comes in a simple-to-use kit. This unique method is already transforming the industry. Wallwik SimpleStrip uses a highly absorbent fabric cloth, and a poweful solution to rehydrate the old paste. The cloths (called "HydroSheets") stick to the surface of the wallpaper, allowing the special power solution to soak through and dissolve the adhesive between the paper and the walls. We hope to be able to bring the Wallwik SimpleStrip product range to you soon directly on our website. In the meantime, you can buy the wallpaper removal kits from their secure online store.